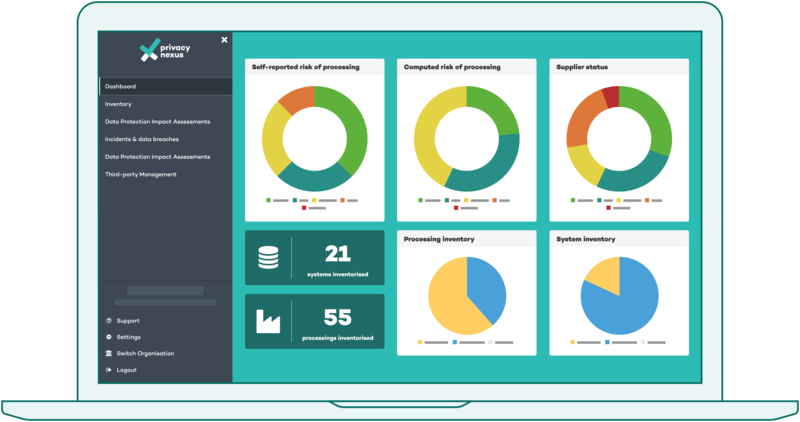 Use Privacy Nexus’ real-time GDPR Dashboard to get a quick and clear overview of what is going on with your privacy administration. Our Dashboard is the starting point of every privacy officer who wants to know the latest status of all privacy activities in an organisation. The Dashboard consists of multiple charts that supply you with various sorts of information about your organisation. Here you can find the status of all the inventory submissions as well as the complete size of your inventory, the computed risk of your processings, the compliance status of your third parties and the location of all your systems. The dashboard also provides you with a log of the latest activities of your employees within Privacy Nexus. This way you can easily keep track of how your organisation is progressing and what areas demand your attention.